The city of Tulsa has welcomed its newest star with open arms. From beautiful weather to barbecue — oh, and new bow ties — Amanda Zahui B. is already enjoying her new home. The No. 2 pick in the 2015 WNBA Draft was formally introduced as a member of the Tulsa Shock at a press conference Monday. 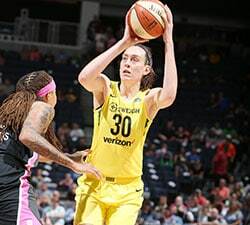 The 6-foot-5 center says she has enjoyed the city’s weather and its food offerings when it comes to barbecue. Zahui B. comes to the Shock after averaging 18.7 points, 11.7 rebounds and 4.1 blocks per game during her sophomore season at the University of Minnesota. 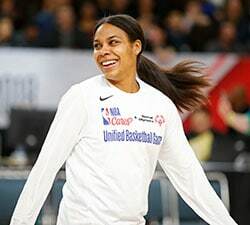 She entered the draft early and, along with Seattle’s top pick Jewell Loyd, changed the entire complexion of the draft. Williams thinks Zahui B. can make an immediate impact for a promising young team. 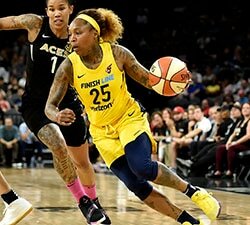 Her ability to come out near the three-point line and set screens before rolling or popping out for a shot adds another dimension to a young and talented Shock offense. The franchise is looking to make the playoffs for the first time since it moved to Oklahoma in 2010. Tulsa missed the playoffs in the Western Conference by four games in 2014 and finished tied with the Storm for the worst record in the league. But with a young core of Skylar Diggins, Odyssey Sims, Glory Johnson and now Zahui B., the playoffs are clearly a realistic goal. Putting the Shock back on the map isn’t her only goal. Making the playoffs and competing with the best teams in the Western Conference will play a part in making that happen. She has her sights set on the ultimate goal, though. 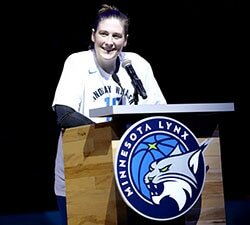 She wants to bring a WNBA title to Tulsa.